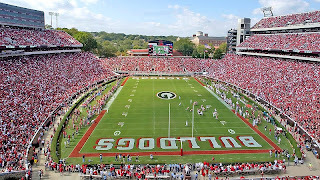 Uga VI's first game vs. South Carolina. Photo from DawgBone.net's Old School Pic of the Week Collection. Great story I heard from a former vet student helping to care for Uga VI that day. Apparently the Seilers and vet folks wandered away from Uga's pen for a bit, and when they returned, the dog had passed out, his airway was blocked, and he was turning blue. They had to perform emergency resuscitation immediately, after which he popped up like the DGD he was and left for the stadium as if nothing had happened. This was all a mere two hours before gametime. Uga "put me in, Coach" VI.